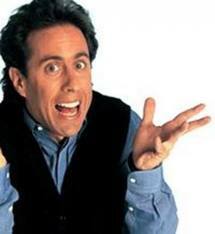 Take Jerry Seinfeld. The dude made a boatload of money over 9 years making a television show about “nothing.” Add to it, that all of that material came from a highly successful comedy act, which he still uses today. Making money on “nothing.” That nothing, however, is what we deal with in our daily lives. One of my favorite episodes was when the gang lost Kramer’s car in the mall parking lot. An entire episode was dedicated to the goofy search for the car. How many of us have ever lost our car in a parking lot? I have…and recently at a grocery store when I realized that I have a new car and I should stop looking for the old one! That episode, as well as all the others take a real-life situation and engages the audience because we can relate. So when you write your next blog post, article, or executive brief OR present your next speech or video, consider your uniqueness. As my professional mentor, Alan Weiss always says, there is nothing new under the sun. You’re methodology, theories, strategies, and the like are not necessarily new. However, you are unique and your experiences make your IP different from everyone else! To create great IP, you have to add one key ingredient…YOU! Pay attention to your life. Don’t think nothing happens to you. It does. Be in the moment and find those crazy little things that make you chuckle or shake your head. Most likely, it’s the start of a great new story.